Recently, VisionArc reported on a current United Nations research initiative to develop a set of quantitative and evaluative tools to measure the economic and external values embodied within ecosystems. The Economics of Ecosystems and Biodiversity (TEEB) is part of a growing conceptual and global policy shift towards more rigorous, coordinated and quantitative standards for ecosystem management. In the past, efforts to develop policies and strategies that address ocean health have been hindered by the ability of experts and policymakers to agree on a common metric for oceans health. This difficulty has been further exacerbated by one of scale too. 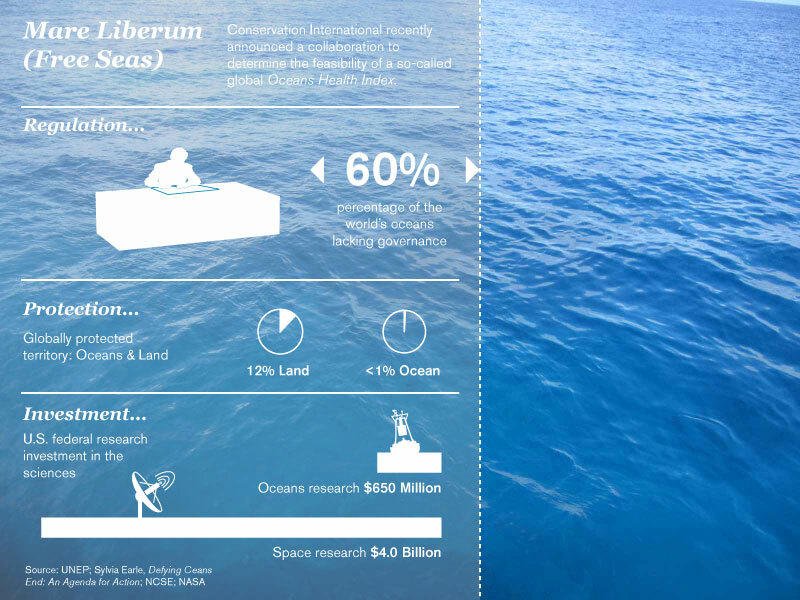 ‘High seas’ territory, or mare liberum- Latin for free seas- accounts for 60% of the planets oceans- or about 83.4 million square miles of unregulated and mostly unprotected territory. This has encouraged a growing number of blind spots. At present, only .5% of the world’s oceans are under some form or environmental protection, while terrestrial ecosystems come in at about 12%. Furthermore, U.S. federal space research investment in 2004 was more than 6 times that which was invested in oceans research (NASA/NCSE). This is despite the fact that in the same year the world’s oceans provided over 100 million tones of fish according to the Food and Agriculture Organization. Needless to say, a NASA food program has yet to be discussed. Such disparities no doubt reflect different forms of valuation. Like the TEEB report, the challenge for an Ocean Health Index will be in developing not only a measurable system to quantify values, but also a flexible system to promote them in vastly different environmental and economic contexts. The flexibility here will be how effective such a system is at bridging between these different contexts in order to design a much needed- yet thus far little understood- definition of global commons governance for the world’s oceans and marine eco-services. Conservation International and its partners have established a steering committee and will be developing a plan to publicly launch the Ocean Health Index on World Ocean’s Day on June 8, 2011.